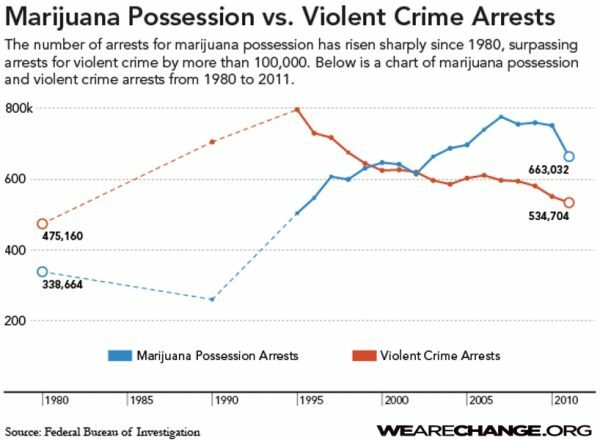 Police Arrest More People For Marijuana Than For All Violent Crimes Combined. On any given day in the United States, at least 137,000 men and women sit behind bars on simple drug possession charges, according to a report released Wednesday by the American Civil Liberties Union and Human Rights Watch. Nearly two-thirds of them are in local jails. According to the report, most of these jailed inmates have not been convicted of any crime: They’re sitting in a cell, awaiting a day in court which may be months or even years off, because they can’t afford to post bail. Federal figures on drug arrests and drug use over the past three decades tell the story. Drug possession arrests skyrocketed, from fewer than 200 arrests for every 100,000 people in 1979 to more than 500 in the mid-2000s. The drug possession rate has since fallen slightly, according to the FBI, hovering now around 400 arrests per 100,000 people. Defenders of harsh penalties for drug possession say they’re necessary to deter people from using drugs and protect the public health. But despite the tough-on-crime push that led to the surge in arrests in recent decades, illicit drug use today is more common among Americans age 12 and older than it was in the early 1980s. Federal figures show no correlation between drug possession arrests and rates of drug use during that time. But the ACLU/Human Rights Watch report shows that arrests for drug possession continue to make up a significant chunk of modern-day police work. The report finds that the laws are enforced unequally, too. Over their lifetimes, black and white Americans use illicit drugs at similar rates, according to federal data. But black adults were more than two-and-a-half times as likely to be arrested for drug possession. “We can’t talk about race and policing in this country without talking about the No. 1 arrest offense,” lead author Tess Borden said. The report calls for decriminializing the personal use and possession of drugs, treating it as a public health matter instead of a criminal one. For example, it sketches the history of Corey J. Ladd, who was arrested for possessing half an ounce of marijuana during a 2011 traffic stop in New Orleans. Because he had convictions for two prior offenses involving the possession of small amounts of hydrocodone and LSD, he was sentenced in 2013 to 17 years in prison as a “habitual offender.” He’s currently appealing the sentence to Louisiana’s Supreme Court. But Ladd’s treatment is far from the harshest drug possession sentence uncovered by the ACLU and Human Rights Watch researchers, who conducted analyses of arrest and incarceration data from Florida, New York and Texas. In Texas, for instance, 116 people are currently serving life sentences on charges of simple drug possession. 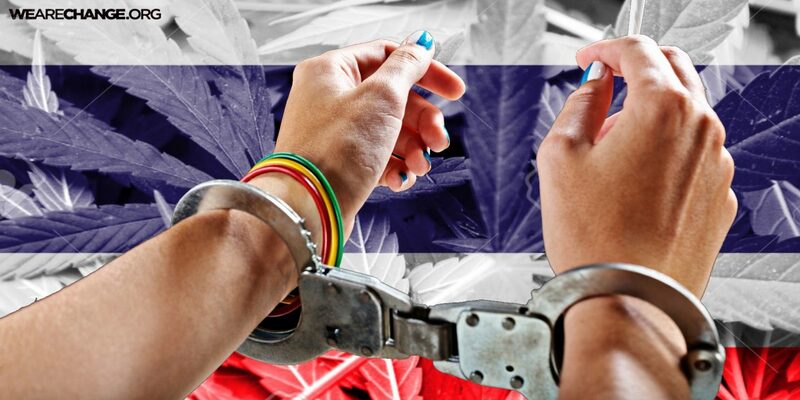 Seven of those people earned their sentences for possessing quantities of drugs weighing between 1 gram and 4 grams, or less than a typical sugar packet. That’s because Texas also has a habitual offender law, allowing prosecutors to seek longer-than-normal sentences for people who have two prior felonies. Christopher Ingraham The Washington Post News Service. PreviousRussian Officials Warned to Bring Back Children Studying Abroad.